Need a pick me up for your day? 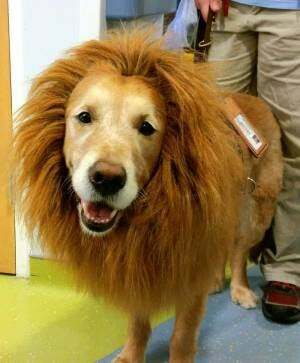 How about a therapy dog (that apparently dresses up like a lion and looks fabulous)? Then meet Recon, the 8 year old golden retriever who was just inducted into the New Jersey Veterinary Medical Association Animal Hall of Fame. I like the bit about the college visits, because I know a local college often calls up our guide dog group to bring our puppies in to de-stress students during finals. Honestly, I think this is a fantastic idea for all schools. But what really got me was the hospital visits, how Recon can just tell when a patient needs him. Apparently he can pick out the rooms of people who tried to commit suicide and goes in to visit with them until they're feeling better. When I get a dog, I'm definitely asking at the shelters for someone with a good temperament for a therapy dog. I'd love to do things like this, from hospitals to colleges to reading with kids. But in the mean time, let's give Recon a hand.